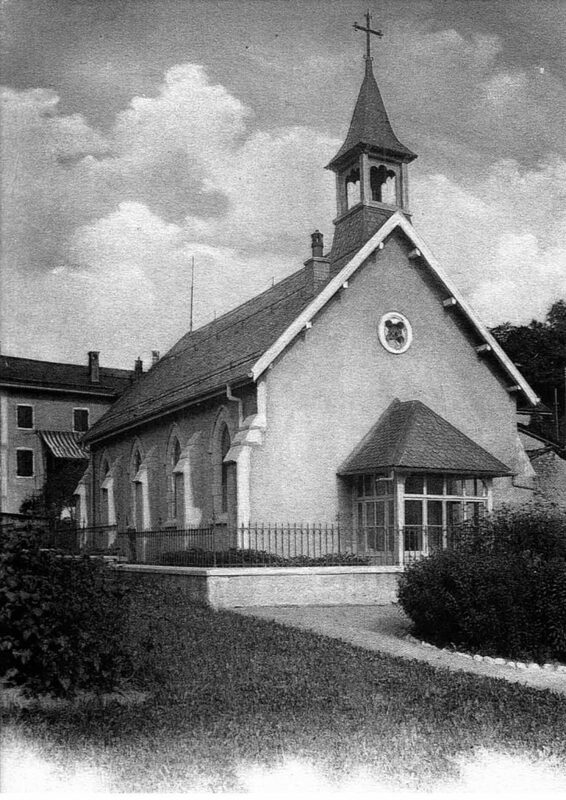 St. Peter’s was one of thirty or so Anglican churches built in Switzerland during the last quarter of the 19th century, when thousands of British people began to discover the beauty of this country. They first came as tourists, but then settled in significant numbers in Château-d’Oex and later Gstaad. With their arrival came the desire for familiar English services amidst familiar church architecture. In January 1898 the brothers Berthod made a gift of land to the then Colonial and Continental Church Society (now the Intercontinental Church Society) for the construction of St Peter’s. This was funded by public subscription which was greatly encouraged by the energetic efforts of a local English resident, Mrs. Claudine Scott. It was on June 28, 1899 that the foundation stone of St Peter’s was laid by the Rt Revd. T.E. Wilkinson, Anglican Bishop of North and Central Europe. On it were inscribed the words “To the Glory of God and in the faith of Jesus Christ …. Prosper Thou our handiwork. 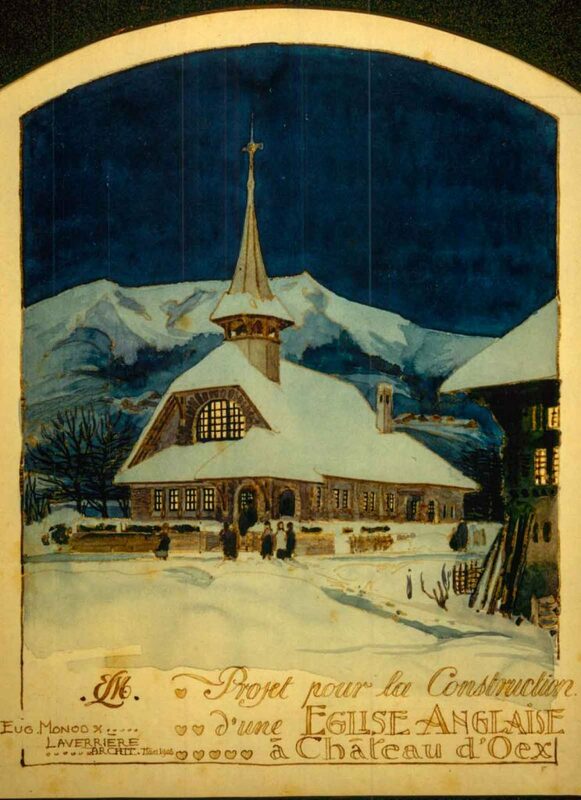 17 June: A contract was signed with M. Jean Gippa at Bulle specialized in Church buildings and who had just finished building the new church at Montbovon. The contract stipulated the church must be finished for the end of August of the same year!! 1 July: The first stone was laid at 2.30p.m in the presence of the Anglican bishop Mr. Wilkinson . The stone was hollowed out and in its centre contained a metal box with some money, newspapers and documents of the period and this was placed in a niche and cemented over. A collection was taken in aid of the building fund and raised 504.55 francs and the ceremony was followed by a tea at Miss Scott’s house Chalet Bellevue. 29 July: A bazaar is held in David Henchoz Morier’s field to raise more money which amounted to 100 francs. 19 August : The roof and spire are erected. The church was opened in 1899, but by the winter of 1905, the congregation had become so large that plans were drawn up for an additional aisle, to increase the seating capacity. Records for the early 1930’s showed that there were around 200 English residents, despite the impact of the depression. Indeed three, and sometimes four, services were held on Sundays, with a total annual attendance of 8,671 in 1932. Despite the effect of Alpine winters, the building has been kept in good repair with electric heating installed in 1931 and a new roof in 1964. As well as the regular congregation, countless visitors have worshipped in St. Peter’s, including in April 1958, the then Archbishop of Canterbury, and his wife, Mrs. Fisher. Extensive restoration of Saint Peter’s was undertaken in 2017. The electrical wiring in the Church, dating to 1930 has now been completely replaced. New heating elements have been installed under the pews with radiators along the North aisle. The stained glass windows have been restored on the south aisle and triple glazing has been added to prevent heat loss. The windows on the North aisle will be restored and replaced in summer 2018. The inside of the church has been completely repainted.